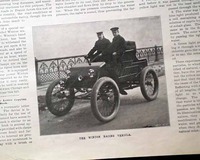 SCIENTIFIC AMERICAN, New York, Oct. 28, 1899 Inside has a nice photo of: "The Winton Racing Vehicle" with a related article. Other prints include: "Wireless Telegraphy at the Yacht Races" "Great Pier at Pot Los Angeles" 'The Isthmus, Catalina Island". 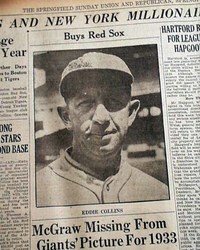 TOPEKA DAILY CAPITAL, Oct. 7, 1924 First col., 3 line head: "Takes 3 Hurlers To End Senators 9th Inning Rally" with two nice 4 line subheads: "One of Wildest Maelstroms any World Series crowd Ever Witnessed Is Won By Giants, 6 To 4" & "In Parade of 'Wooden Pitchers' Four Are Used By Each Team During Hectic Fray at Polo Grounds". In nice condition. SCIENTIFIC AMERICAN, New York, June 20, 1903 Full front page photos of Ore-Unloaders at Ashtabula Harbor, plus "Machinery for Operating Ore-Unloaders at Conneaut." 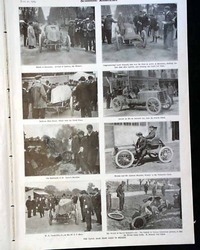 Inside photos and article of the Paris to Madrid Auto Race. Good condition. 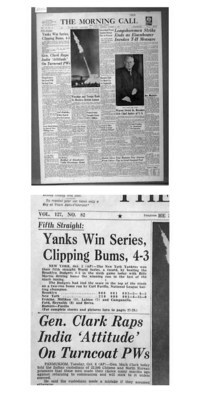 MORNING CALL, Allentown, Pa., Oct. 6, 1953 Two line, two column head: "Yanks Win Series, Clipping Bums, 4-3" tells of the New York Yankees' fifth straight World Series title. Ftpg. only! NEW YORK POST, October 27, 2000. 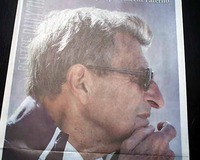 Great front page headline: "DYNASTY" with photo and plenty of inside news and photos. Great condition. 128 pages. 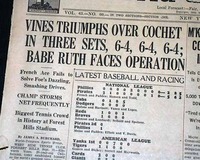 POLICE GAZETTE, New York City, New York, July 25, 1925 This issue as a full page photo inside of Hall of Famer "Goose" Goslin sliding into a base, captioned: "The Goose' Is Safe At Third Base, Thanks To A High Peg." 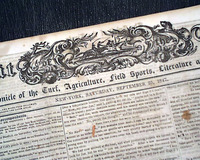 Described in the masthead as: "A Chronicle of the Turf, Agriculture, Field Sports, Literature and the Stage." 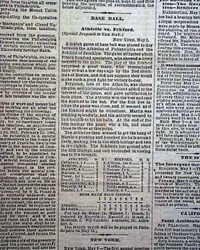 Inside has the summaries and scores of two cricket matches, plus the lyrics of the "Song Of The "Orleans Drinking Club". 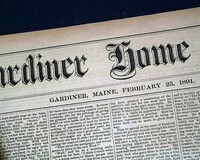 THE GARDINER HOME JOURNAL, Maine, February 25, 1891. HARPER'S WEEKLY, New York, February 19, 1887 (print only) This is a single page illustration entitled "Sketches on a Man-Of-War Under Sailing Orders -- The Last on Board" by Frederic Remington. 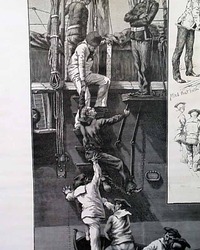 This print features an inset which contains five other illustrations. 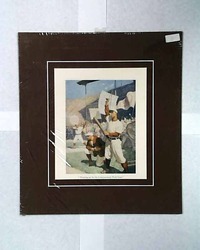 This measures approximately 16.25 x 11 inches and is in very nice condition. Very suitable for framing. 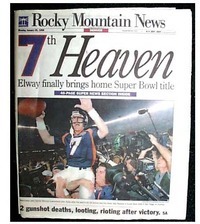 ROCKY MOUNTAIN NEWS from Denver, dated January 26, 1998. 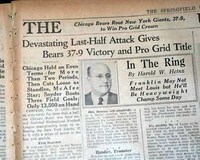 Nice front page and back page (see photos below) headlines and photos of the first Super Bowl title with John Elway leading the way. More inside. 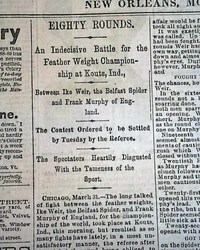 A tabloid-size newspaper, in very good condition. THE DETROIT FREE PRESS - PARADE, Detroit, Michigan, December 18, 1949 The front of this issue contains a photo of Esther Williams, not wearing her usual swimming suit, but rather in winter-wear and with ice skates as she was promoting a new movie "Duchess of Idaho". 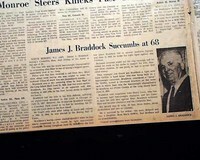 Additional stories and advertisements are within. 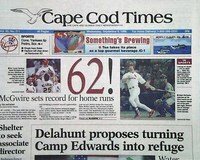 CAPE COD TIMES, Haynnis (Cape Cod), Massachusetts, September 9, 1998 See the photos for very displayable coverage regarding Mark McGwire's 62nd home run of the season, breaking Roger Maris' home run record. 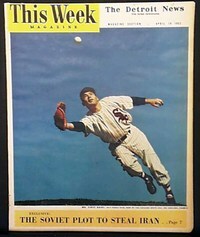 This is the complete issue and is in very good condition (see images). 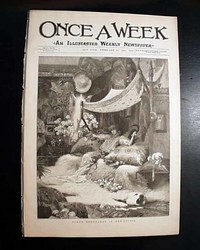 Here a full page pictorial print from the March 1, 1894 issue of Harper's Weekly. 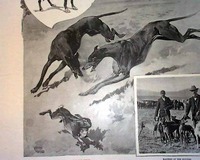 The title of this print is: "Winter Sport In Colorado, Hunting With Hounds The Jack-Rabbit Of the Prairie". Print only ! SCIENTIFIC AMERICAN SUPPLEMENT, New York, February 19, 1898 The front page has nearly a half page photo: "Seal Fisheries, Pribylov Islands--Bachelors On The Beach--St. Paul In The Background" and a half page illustration: "Fur Seals On The St. Paul Island In Bering Sea". 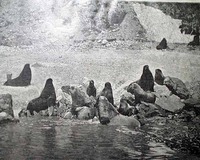 The report "Our Fur Seals" talks about extinction and conservation. 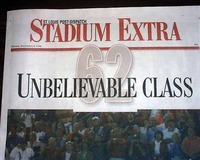 THE ST. LOUIS POST DISPATCH -- STADIUM EXTRA, September 8, 1998 This "Stadium Extra Edition" reports Mark McGwire's breaking of Roger Maris' single season home run record. 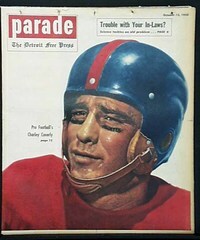 This issue is unique and quite difficult to find as it was only available at the stadium. Great to have this report in a St. Louis paper. KANSAS CITY KANSAN newspaper from Kansas City, KS, dated October 28, 1986. 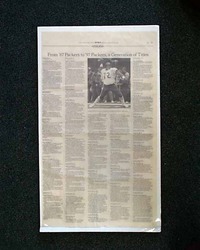 This 10 page newspaper is in nice condition and contains the reporting on the New York Mets winning the World Series championship on page 6. See photos. 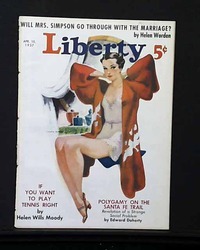 LIBERTY magazine, New York, dated April 10, 1937 The color cover of this issue has an illustration of a young lady in her dressing room (see photo). 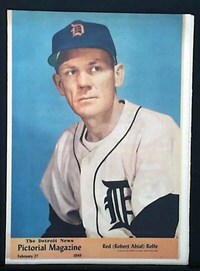 There are colored advertisements for Camel Cigarettes, Beech-nut Gum and Lucky Strike Cigarettes. 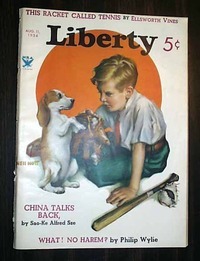 "If You Want to Play Tennis Right" is an article written by Helen Wills Moody. 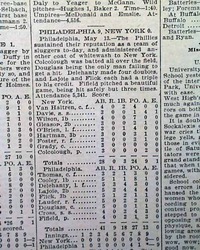 THE DAY, Philadelphia, Pennsylvania, May 10, 1871 The front page has: "Base Ball" "Athletic vs. Eckford" being a brief game summary and box score. Nice to have on the front page. 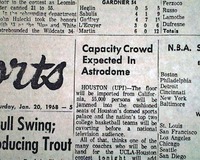 Other news and advertisements of the day are within. 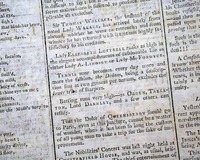 Complete in four pages with vertical fold wear and a few small holes, not affecting this report, otherwise in good condition. 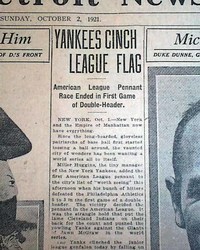 THE DETROIT NEWS, sport's section only, October 2, 1921. 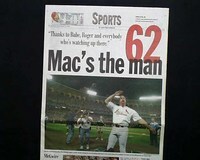 ST. LOUIS POST-DISPATCH, Missouri, September 9, 1998 See the photo for a terrific & very displayable newspaper celebrating Mark McGwire 62nd home run of the season, breaking Roger Maris' home run record. 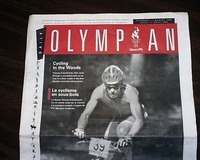 Great to have in a St. Louis newspaper! 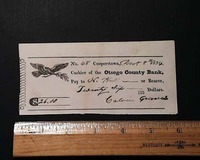 This is the complete issue and is in very good condition with only a slight even toning (see images). 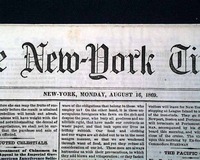 Note: This is a 1st edition printing - not one of the common reprint editions. 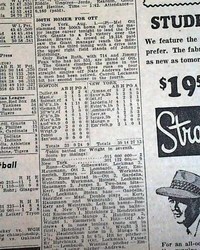 The sport's section (page 9) has a very small heading: "500th Homer For Ott" with box scores. See image for small, brief report here. 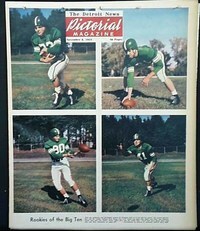 This single-page is approximately 13 x 22.5 inches and features an article entitled "From '67 Packers to '97 Packers, a Generation of Titles". This contains all the Super Bowl information from Super Bowl I through Super Bowl XXXI - including the host city, game date, playing teams, final score and a synopsis of the game.